I like checking out movies where the director leans into restrictions, because those restrictions usually foster creativity. 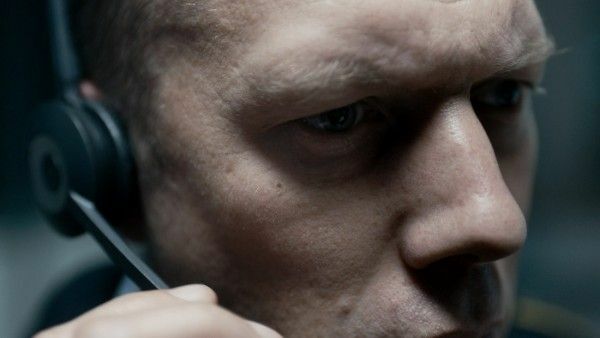 Gustav Möller’s The Guilty uses the restriction of space, keeping its protagonist confined to an emergency services dispatch station, and largely tethered to a phone. Despite a limited setting, Möller makes the most of his drama, keeping the action tense due to a powerful story and a tremendous performance from lead actor Jakob Cedergren. However, a late twist threatens to derail the entire picture by reducing supporting characters to mere plot points to serve the arc of the protagonist. 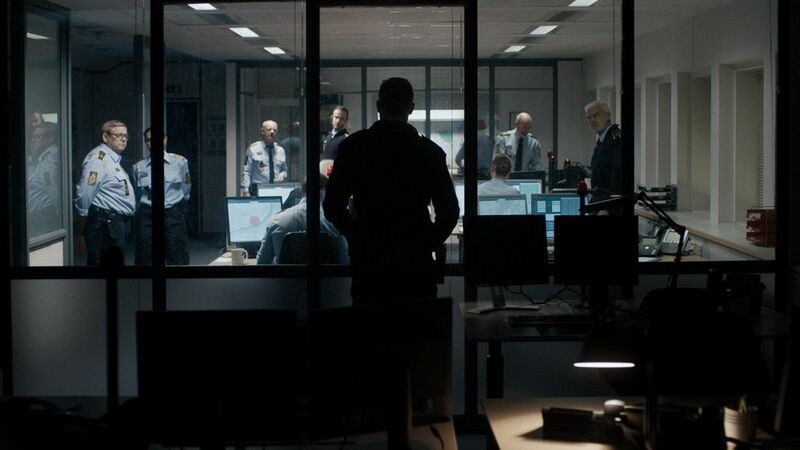 Police officer Asger Holm (Cedergren) is stuck manning the desk at an emergency services center, taking emergency dispatch calls while he awaits trial over an unknown action. After brusquely dealing with the first couple of callers, he receives a call from a woman who has been kidnapped by her ex-husband. Trying to solve the case and rescue the woman entirely from his desk, Asger tries to outwit and outmaneuver the situation believing the ends justifies the means. However, as he continues to make calls and learn more information, he starts to realize that saving this one woman won’t save him. If anything, it may only serve to highlight the flaws that ruined his life in the first place. Everything takes place inside the dispatch center, so while we see the occasional other emergency services worker, we never see the people on the other end of the line. This means we’re always sharing Asger’s POV, working off the same info, and it’s exhilarating at first as he tries to cleverly acquire information by using his limited resources. We see him try to get as much information out of Iben, the kidnap victim, as possible without alerting Michael, her kidnapper. We see Asger track down leads, recruit anyone that can help, and go all out to save Iben. But what starts out as a thriller eventually morphs into a tragedy as Asger learns startling new facts. It’s impossible for your heart not to break when Asger is on the phone with Mathilde, Iben’s six-year-old daughter, and she’s pleading to see her mommy again. It gets even darker from there, and while I won’t go into any spoilers, Möller always has us on Asger’s wavelength from righteous indignation to horrified discovery to blind fury. It’s an emotional rollercoaster and yet we rarely leave Asger’s desk. Credit is also due to Cedergren, who sinks his teeth into the role. He’s center stage the whole time, and he uses his restrictions to his advantage, letting us read the emotions on his face but rarely getting the opportunity to interact with other characters in person. It’s reminiscent of Tom Hardy’s performance in Locke, another character who’s trying to solve problems via phone call, and it’s just as commanding. Additionally, by hiding exactly what Asger did to get assigned to desk duty, we can never completely trust him, and Cedergren’s aggressive performance keeps us on edge. Where The Guilty falters is in a late twist that you dread coming and hope that the movie can just play the plot straight. It’s not a story that’s lacking for drama, and to twist the situation—an abusive husband kidnapping his ex-wife and potentially harming her—cheapens the reality of domestic violence. But domestic violence isn’t “enough” for The Guilty because the movie needs to close Asger’s arc, so it cheapens Iben’s story with a late reveal because it needs Asger to confront the actions that landed him at dispatch. Iben’s struggle then just becomes a platform for Asger to have a cathartic moment, and it hurts both characters as well as the overall film. Despite this misstep, there’s no denying the power of Möller’s direction or Cedergren’s performance. The Guilty always holds our attention and finds clever solutions to its self-imposed limitations. Although I’m sure some American production company will want to remake it, the problem with The Guilty isn’t that it’s in Danish or that it doesn’t have an American actor in the lead role. The only problem is that it can’t find a way to a resolution, so it has to take a shortcut that weakens the conclusion.